This piece originally appeared in print for Provokator Magazine, October 2007. There are some books created by Fate. Books that call upon the writer, move his hand, and assist in their own invention. These books have a life of their own, drawing readers to them. I am one such book. You know me as The Devil’s Bible, the Codex Gigas, The Great Book, the largest book in medieval history. You know that my pages are made of the skins of 160 donkeys. My parchments are illuminated in the maroon of dried blood, the gold of the Sun, the black of dark moonless nights, the green of the earth from where I was born in the year 1229. They say that I was created by a penitent Bohemian monk who shamed his Benedictine order in the town of Podlažice. To repent for great sins and to forgo his punishment of being buried alive, the monk vowed to make the most splendid book ever known to man. The monk had but one night to complete this Herculean task, if he was to be absolved of his crimes. Sweating, shaking so much he could barely move his pen, he prayed to God for help. His cries went unanswered. In a moment of his bleakest desperation, he prayed to the Devil. His plea was answered, and, with the Devil’s help, the most magnificent book men have ever seen was, in an instant, created. I know not what came of this monk who toiled like a demon until his fingers were bloody and raw, bones exposed and tendons tearing. But I do know a secret. The secret is that I am alive. I was always alive. It was me who drove the monk’s hands and molded myself into being. I took his soul so that I might take shape, live, and survive. I needed to exist: my form was waiting to take shape. I ate his soul so that I might live. I savored its glow as I sucked him dry. I left him empty. Look closely at my pages: you will see the breath of my life within. The light that emits from within me. The pull that draws you nearer and nearer to me until the sirens ring and you are handcuffed, face down on the floor weeping at my glory. Look! The slight shifting, the easing of myself into more comfortable positions, the curling up of my pages with distaste or pleasure. I am not sorry for what I have done. For almost 400 years I have been inside this glass case, but this does not mean that I am a prisoner. I seek out minds, I bring them to me, I drink of their experiences and I dream their dreams. They dream my dreams too, these visitors. I exist, like my pages, for illumination. Awakening. I am the rustle of history’s heavy breathing. I am the wonder of faith’s magic. I am proof. I have called you here to whisper the knowledge of the days long gone. My weighted pages smell of the dank crypts and the shallow graves where you were once buried. You hear my voice because we have known each other before, in the dark pages of history. You walked with me once. You hands caressed my pages and your eyes filled with tears at my pained beauty. You saw inside to the soul that throbs within these pages, aching for touch. They say I was stolen from my home, seized as spoils during the Thirty Years War and whisked away to a faraway land. This is not the truth. I go where I must. I stay where I must. Nobody can keep me where I do not choose to be. Prague called to me, so I have returned. My dreamscapes are haunted and fierce. I collect the faces I will summon. My work grows clearer with each changing shape of the Moon. I am home now, ensconced in the secrecy that has always been my shadow. I will sit in my glass case and wait. For you. 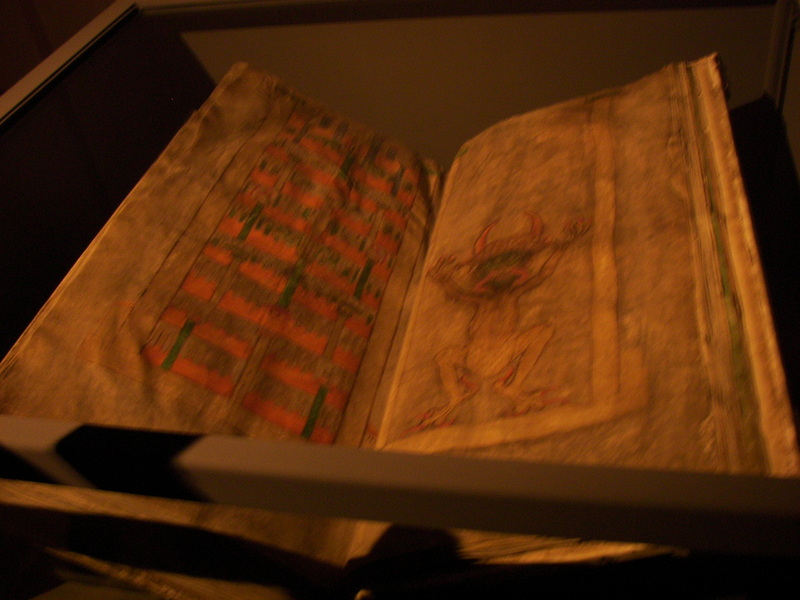 The Devil’s Bible is on display in Prague’s National Library until 6 Jan, 2008. See www.nkp.cz for details.